We rode in the Tony Grove area today. We tested many slopes from northwest to southeast and found that steep slopes were not your friend (not just because of avalanches). The last series of storms came in with a lot of grauple and it had slid/rolled off of anything over 35 degrees. That left anything over 35 degrees with an icy bed surface with about 4 inches of new snow on top. We found much better riding on slopes around 30 degrees where there was about a foot of great riding snow. There was a fair amount of minor sluffing on steep slopes but nothing propagated beyond the sluffs. The picture below is one of those sluffs. The longest running was around 200 feet by 30 feet wide. The sluffs ran on the icy bed surface on all aspects but didn’t really carry much of a punch because of a lack of deep snow on steep slopes. 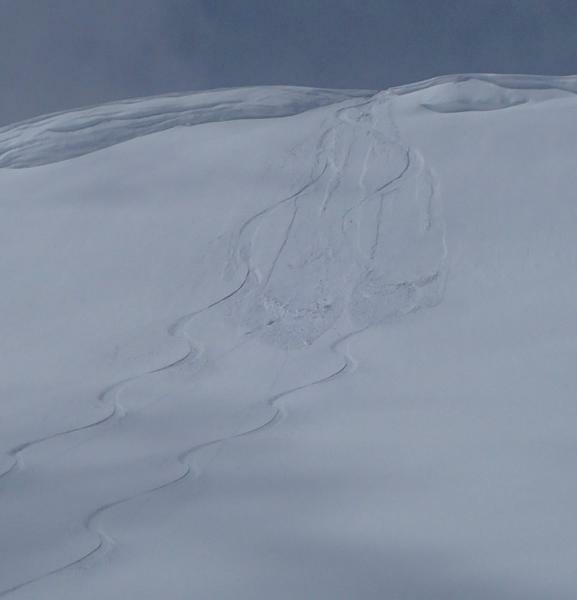 We did not notice any other cracking or collapsing while riding other than small cornices releasing while riding over them. The snow was pretty wet on most aspects by about 1:00 but there was still some good powder left on North facing slopes.